Every so often you come across a web application that is a game changer: the utility of browser plugin reframeit is a hugely powerful adjunct to your use of the entire web.The video above demonstrates marking up the transcript of a political speech with associated facts and links using reframeit that will be associated with specific areas of that content for as long as you want them to be. Every so often you come across a web application that is a game changer: the utility of browser plugin reframeit is a hugely powerful adjunct to your use of the entire web. The video above demonstrates marking up the transcript of a political speech with associated facts and links using reframeit that will be associated with specific areas of that content for as long as you want them to be. By providing the ability to write 'notes in the margins' of any browser content, and then share those notes with your defined audience, you have a very powerful contextual tool with an extremely wide utility. Reframeit allows you to annotate specific content on any web page, much as you would write notes in the margin of a book (Reframeit provides a 'margin' area next to every webpage to contain comments). The game changer is your ability to then share your notes with a chosen audience, and for others to share their notes with you. From a commercial perspective an example could be marking up your competitor's web site and sharing it with your sales team, who can continue to update their contextual notes in the field. Providing context to specific content is key to so much of web communication and the holy grail of social media marketing practitioners. What is so intriguing from a workflow perspective is the ability to add notes to internal web applications, so notes can be appended to specific products for example to provide everything from training to departmental feedback. As a collaboration tool reframe it has enormous use across a very broad spectrum. 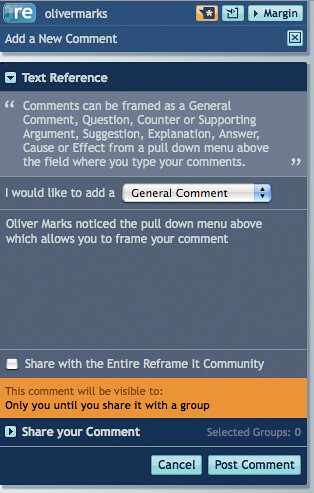 Comments can be framed as a General Comment, Question, Counter or Supporting Argument, Suggestion, Explanation, Answer, Cause or Effect from a pull down menu above the field where you type your comments. 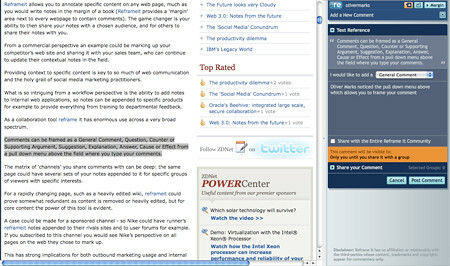 The matrix of 'channels' you share comments with can be deep: the same page could have several sets of your notes appended to it for specific groups of viewers with specific interests. For a rapidly changing page, such as a heavily edited wiki, reframeit could prove somewhat redundant as content is removed or heavily edited, but for core content the power of this tool is evident. A case could be made for a sponsored channel - so Nike could have runner's reframeit notes appended to their rivals sites and to user forums for example. If you subscribed to this channel you would see Nike's perspective on all pages on the web they chose to mark up. This has strong implications for both outbound marketing usage and internal contextual notes. ReframeIt CEO Bobby Fishkin came up with the idea for the product after spending four years tracking down and examining what Tolstoy, George Eliot, Thomas Hardy, Coleridge, C.S. Lewis, Melville and others hand-wrote in the margins of their personal copies of Shakespeare's Richard III. It was clear to him that the position of their comments--right next to the passage to which they were responding--was key to how these writers engaged these texts. Fishkin, along with co-founders Chief Technology Officer Brian McKinney and Lead Engineer Benjamin Taitelbaum, created reframeit to make the same relationships between commentary and text possible for the entire web. This academic contextual note taking precedent is well understood by users, and by providing the ability to add commentary onto web sites, reframeit creates a "transparency engine" for the Internet. "Reframeit can help curb the power of misinformation to distort our national conversation about issues that matter. Anyone who cares about the quality of public dialogue in this country should welcome the transparency it makes possible," notes Harvard professor Henry Louis Gates, Jr., Director of the W.E.B. Du Bois Institute and co-founder of The Root. The power of the transparency demonstrated in the political video example at the top of this post should be self evident. The ability of reframeit to bring transparency to specific collaboration teams is something I will be experimenting with; I think it has tremendous utility in the modern enterprise.